When Apple released the latest version of its mobile operating system last month they added features and functionality in their messaging app that can be utilized by both distributors and exhibitors to market their offerings. The enhancements in iOS 10 allow users to include branded content in their messages and even purchase movie tickets, as Disney and Fandango have already demonstrated. Apple is not the first to expand their messaging app from an existing communication platform to one with robust commerce components. They are following in the footsteps of chat apps such as Line in Japan and WeChat in China. Both of those apps initially offered text messaging capabilities when they launched in 2011. Since then Line has grown to over 220 monthly active users (MAUs) and raised USD $1 billion during their initial public offering on the New York Stock Exchange. WeChat (or Weixin as it is known in China), which was created by TenCent, now has 700 million active users who do everything from in-store mobile payments to hailing taxis, ordering food at restaurants to playing games, all without having to leave the app. Over a third of all time people spent on the internet in China is spent on WeChat, with the average user opening the app at least 10 times per day. What companies such as Line and WeChat have really done is show companies around the world that chat apps are about more than text messaging, providing a blueprint for messaging platform monetiziation. They’ve also proven just how lucrative such apps can be, with WeChat earning USD $1.8 billion in 2015 through gaming, adverting and small fees on payments. It is this precisely this opportunity that Apple is trying to capitalize on with its update to the iMessage service, the backbone of Messages, the native texting app on the iPhone used by almost 1 billion people every day. As part of the release Messages will now support iMessage animations, enhanced emoji, sketches and, maybe most importantly for movie marketers, third-party apps and sticker packs. Disney was one of the first studios out of the gate to develop branded sticker packs. 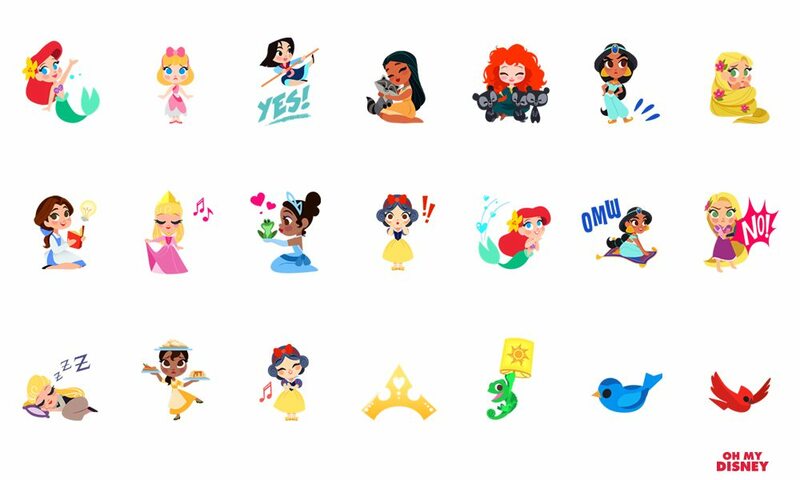 There are 11 sets of Disney Stickers, as the company has named them, for properties such as “Beauty and the Beast”, “Frozen” and “The Lion King”, as well as this year’s “Finding Dory” and “Zootopia”. There is even a set for “Star Wars”. All can be downloaded from the iMessage App store included with iOS 10. These virtual stickers are more than simply fancy emoji; each sticker is animated and can be sent in stand-alone messages or pasted onto a conversation bubble. Users can even past stickers onto photos. While a number of sticker packs found in the store are free, Disney has priced each of its packs at USD $1.99. That means users who download and share the stickers are not only helping build awareness of the Disney brand and specific releases, but paying for the opportunity to do so, generating revenue for the studio from what ordinarily would have been a marketing expense. Though not every distributor has as a library as large as Disney’s, nor ones which lend themselves so naturally to animated virtual stickers, they can still use sticker packs to promote upcoming releases, or more accurately, have the users of Messages promote the movie for them. And, to be sure, the generic popularity of Disney’s animated films allows the company to sell sticker packs, which may not be possible for all film properties, however distributors might find they get more marketing value from giving stickers for certain titles away for free. After all, the goal for distributors, and even exhibitors, in creating sticker packs is to get a brand, movie or offering in front of people so that they are aware of its existence. Messaging apps may prove to be an ideal channel for such a purpose, since their usage is much larger than all the popular social networks like Twitter and Facebook. Engagement with messaging apps is also much higher, with such apps being launched an average of nine times per day, as compared to the twice per day that social networking apps are launched. In addition, stickers are being shared between users in a conversational, contextual and an often emotional manner, creating viral word-of-mouth marketing that is less overt and which people may not automatically tune out. Apple is well aware companies and brands would be using the iMessage platform for marketing purposes and as such provides download and usage data through the app store. This enables marketers to know various metrics such as which content and stickers are popular with users and which are being shared the most. In turn, this facilities the fine-tuning of ongoing campaigns. Of course, the whole point of most marketing is to influence the purchase of a product. That’s where the power of third-party apps comes in as Fandango illustrates with their iMessage app that makes buying a movie ticket as easy and frictionless as possible. When texting, a user can open the Fandango for iMessage app (essentially an app within an app) to pull up all the latest movies at cinemas near them. They can quickly learn more about the movie, search for showtimes and even purchase tickets without ever leaving the app. 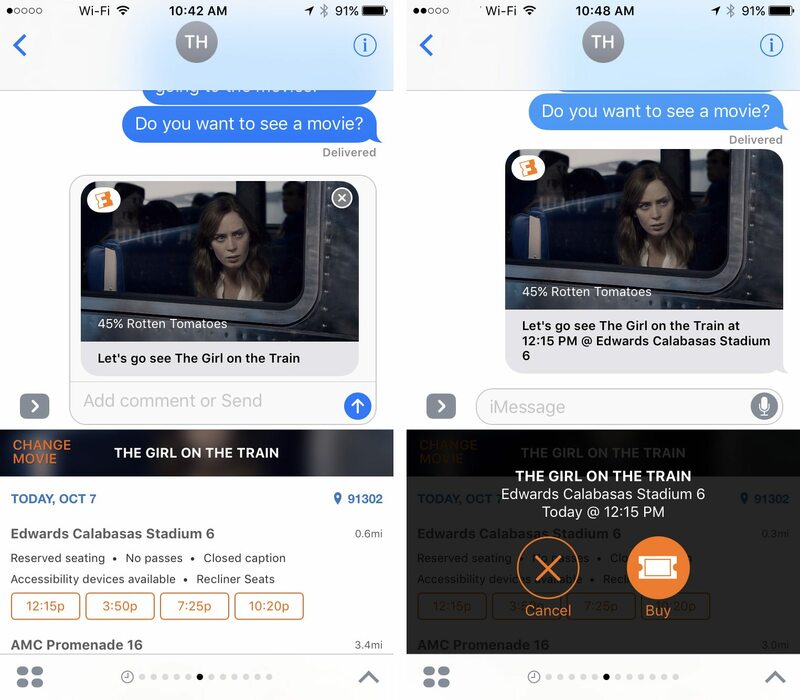 Examples of the Fandango iMessage app that allows users to purchase movie tickets while sending text messages. What might be more impressive is how this whole process can take place as moviegoers chat with each other about their plans to see a movie. Fandango’s iMessage app let’s users send movie and showtime info to each other, along with ticket purchase options. Making the process even more slick, and possibly faster or more efficient, is that Fandango allows users to securely purchase tickets using Apple Pay, all in a single touch. Because the iMessage app store was only just launched it is uncluttered, so this is a rare chance for distributors and exhibitors to make a first-mover entrance on a widely used mobile platform. Given the high usage and engagment rates of chat apps, especially in comparison to this for social networks, we can expect to see developers flood the iMessage App store in the coming year. It is also inevitable (and is already happening) that other messaging platforms like WhatsApp (which has 1 billion MAUs) and Facebook Messenger (with 800 million users) will quickly enter the fray.